The footwear brand n.d.c. – nom de code/code name is the creation of two friends passionate about shoes with over 10 years experience in the footwear business. Wanting to make shoes individualistic interpretation of the classics. The key factors in every collection are: simplicity, quality, originality and construction know-how. Working with only the finest tanneries in Italy, England and America, and made in small artisan factories in Spain and Portugal, n.d.c. has inspired a cult following of shoe aficionados. Desert Son of Santa Fe carries n.d.c. 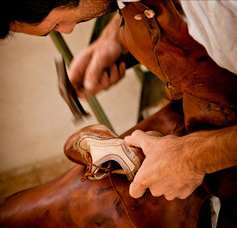 made by hand footwear. Contact our shop for inquiries on our current inventory.